Cassady McClincy proves The Whisperers are more than meets the eye. Photo by Jackson Lee Davis/AMC. Jesus is dead, soon to be buried. Negan’s escaping Alexandria after six years in solitary. This is how TWD returns and nobody’s around to stop him other than little Judith Grimes, who aims a pistol at the bad guy that’s about half her size. She lets him go in a mistake that’ll surely come back to haunt her and her family. 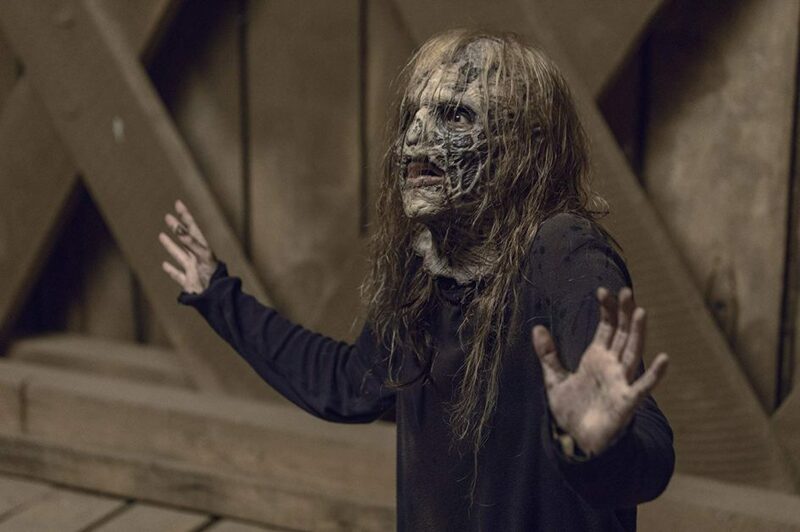 Returning back to Hilltop, Daryl and his crew captured one of The Whisperers, whose name is technically Lydia, but she doesn’t use it whenever wandering in walker herds wearing an undead mask. Tara seems to be in charge of Hilltop now. Sanctuary’s trashed (and abandoned). After a brief sabbatical, Negan willingly returns to Alexandria via Judith’s guidance. There’s a mega herd wandering nearby. Rosita’s apparently pregnant and it seems more of our main characters will soon get acquainted with other members of The Whisperers. There’s a new sense of uneasiness among our survivors as they deal with this new threat. And that new element is a good addition for the show, which had gotten a little stale in its storytelling the past couple of years. Very hopeful this menace takes out a few of our heroes to prove they’re not messing around. Not a lot of screen time was given to many of the main characters (or many of the supporting characters), but Negan finally got to escape his 10 x 10 cell for the first time this season. Instead of getting chunks time for pages of monologue, he spent a fair amount of time seeking a new leather jacket. Too bad he didn’t reacquaint himself with Lucille, but he did happen to find a steel pipe that worked just as well. Guess we’ll have to wait and see if there’s a possible reunion awaiting in the next few episodes. One Easter Egg that was revealed on Talking Dead happened when Negan tried drinking some freshwater from a nearby stream… then quickly threw up when he realized it wasn’t clean. This scene was filmed at the exact same location where Negan initially made his grand appearance and killed Abraham and Glenn. Greg Nicotero mentioned he used the same camera angle and had Negan on his knees, much like the two victims who succumbed at that very spot two years ago. So much synergy in this episode! It’s taken a little bit of time — and probably too much effort by killing off/writing off a few main characters and assigning a couple of new showrunners — but The Walking Dead finally feels like it’s gotten a soft reboot. With so many new characters and new situations for the pre-established ones from earlier seasons, this is a really good time to check back in with the series, in case you might have taken a break from seasons past. Who would have thought it only took introducing The Whisperers for TWD to finally get back to its roots?